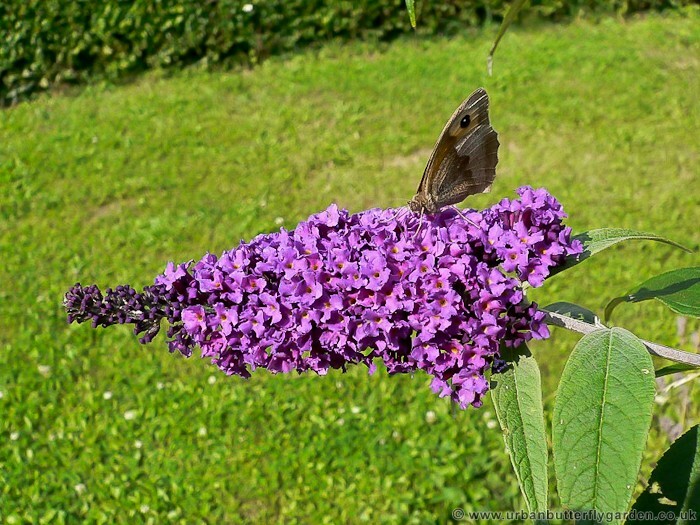 Probably the most popular of all the butterfly attracting plants & shrubs, there are many varieties and colours of buddleia, the most common species being Buddleia (davidii) which was first introduced to Britain in the 1890s from central China, a hardy shrub with long woody stems and long spear shape narrow leaves. 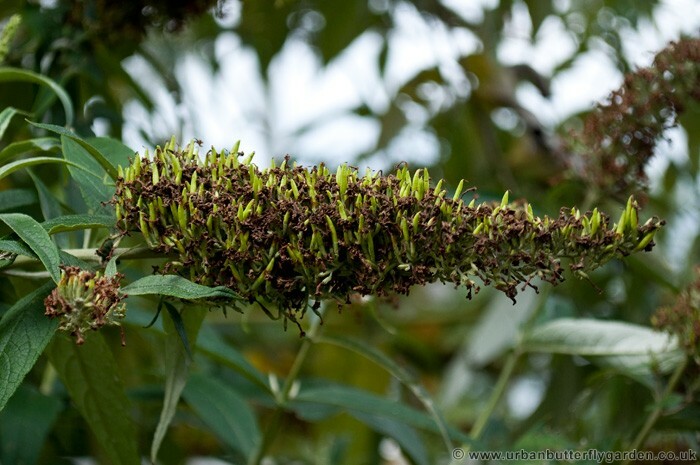 Tolerant to many climates and most soil types, and having few pests or diseases that effect growth, uncultivated species of buddleia can often be seen on old waste ground, factory sites and other disturbed areas, as its seeds easily distributed by wind and rain. 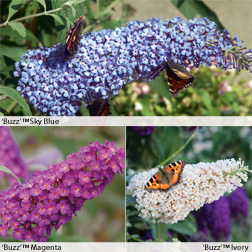 Cultivated species of buddleia (butterfly bush) are now available, in many different colours which flower longer, providing a great nectar source for Butterflies, Bees and other insects from June to December. Although most varieties are quite vigorous growing in late spring they are far less evasive than the original b. (davidii) and would probably be more suitable for smaller gardens. Known for providing a wonderful spray of colour and fragrance during the summer months, Buddleia is probably more widely known for attracting, large numbers of butterflies sometimes up to 8 or 9 different species, butterflies like the :- Red Admiral, Peacock, Painted Lady, Brimstone, Comma, Large White, Small White, Small Tortoiseshell and Meadow Brown. 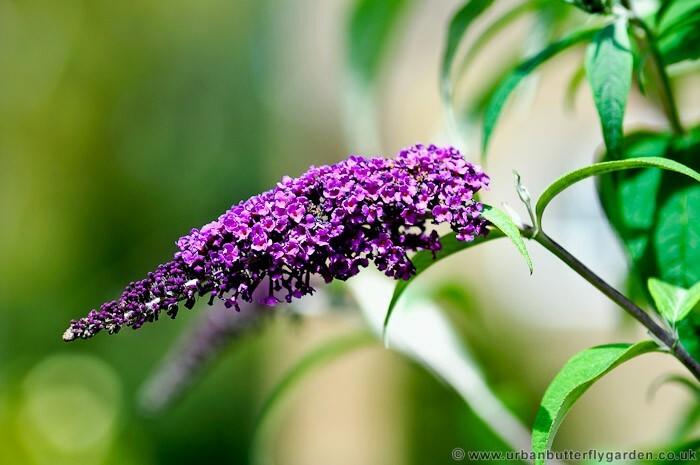 Buddleia can also tolerate being grown in large pots and patio containers, grow in any fertile well drained soil in full sun, ideal for a display or if space is a problem. The world’s first patio buddleia!, and a true dwarf. Perfectly proportioned and cultivated specifically with patio pots and small gardens in mind, by Thompson & Morgan. These easy to grow and problem-free, plants, are loved by bees and butterflies, carry a RHS perfect for pollinators logo and will not take over the garden. Planting Position: Full sun to partial shade. Soil Type: Any Well Drained or containers (for containers use John Innes No3) . 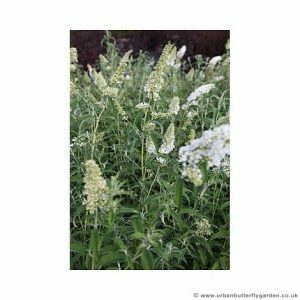 Buddleia White ‘Profusion’, with it’s long white elegant plumes of fragrant nectar rich flowers make it, the classic white buddleia bush. More refined than other large buddleja’s with a nice bushy habit, it also holds an RHS AGM. 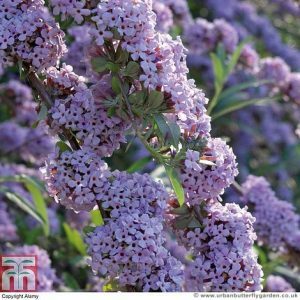 It possibly doesn’t need to be said that it’s a great shrub for attracting butterflies, moths, bees and other pollinating insects into the garden. Soil Type: Any well drained. 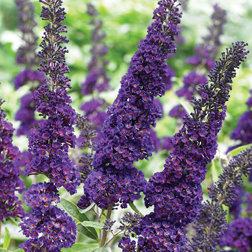 Buddleja ‘Black Knight’ is possibly the most popular and well known of all the larger varieties of Butterfly bush. Grown in the Garden for it’s fragrant deep, indigo-blue flowers, ‘Black Knight’ is low maintenance, drought resistant and will grow well even in poorest soils, year after year. Height and Spread: 2.5m (8.2″). Ideal For: Wildlife garden, Cottage or Low maintenance garden. 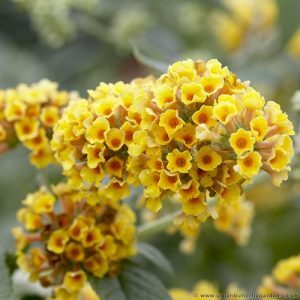 The flower spikes of the weyeriana (sungold) are unique from other buddleia variates, made up from a number of ball shaped clusters of flowers, they merge close together when in full bloom, to create the full flower spike. 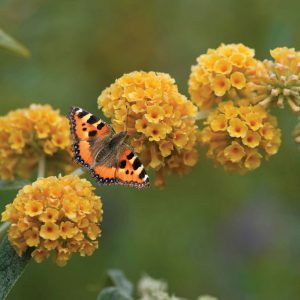 Available as established plants in a 9cm Pot More information at "You Garden"
TIP: Grow Buddleja plants in patio containers just use a quality soil based compost. 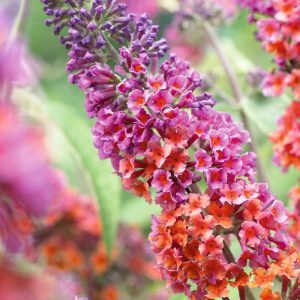 Small and compact Chip Buddleias are sweet scented, look stunning and make perfect plants for patio pots or containers. Their fragrant sweet scented blooms are just as attractive to Butterflies and other nectar loving insects, as the much larger varieties of Buddleia, with the advantages of low maintenance, a compact growing height of just 2ft tall and will not self seed around the garden. Height and Spread: 200cm (79"). With golden lemony yellow-orange globe-shaped flowers, Buddleja globosa or "orange ball tree" buddleia, is easy to grow and is an ideal shrub for a wildlife garden, cottage or low maintenance garden. Slower growing than its davidii cousins it is also non-evasive. 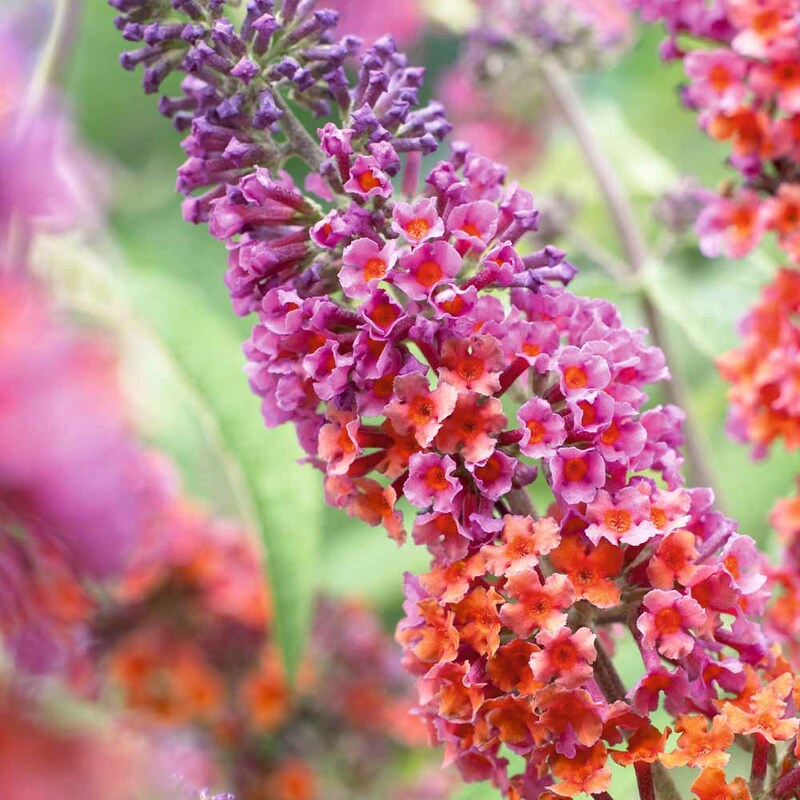 The Amazing colours of Buddleja 'Flower Power' change from deepest violet to rich butterscotch yellow make this quite an unusual buddleia. The deep colours and scented blooms are certain to attract butterflies and other beneficial insects. 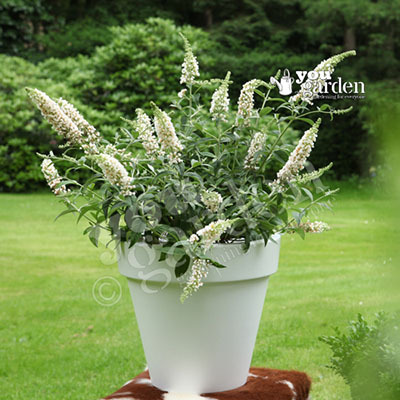 A Height and spread of 200cm (79") also makes this buddleia perfect for small gardens. All species Buddleia, benefit from pruning off the faded flower heads during the summer months, to force a second crop of flowers. Hard pruning in late winter (Cutting back at least two thirds of the bush) encourages plenty of new growth for the coming year, other than this buddleia requires very little attention. 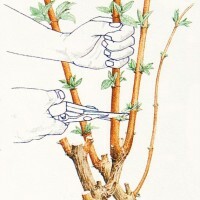 If you would like to know more about How to prune and shape Buddleia - Click Here to easy to follow Guide. Buddleia is probably one of the easiest garden shrubs to grow from either cuttings or from seed, and it is possible for even the most inexperienced gardener to have flowering shrubs within the first year of planting. 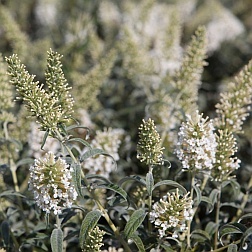 The most popular method of propagation of buddleja or buddleia, is from cuttings, often taken from a mature shrubs in late August into September, this maybe because sometimes collecting the small seeds can prove to be a little more tricky, so buying a packet of seeds should not be overlooked, they are cheaply available and have the advantage of coming in mixed varieties. Click Here to View Buddleja davidii (Mixed) seeds at Thompson & Morgan. © Urban Butterfly Garden 2010-2019.